Home / Movie Reviews • Reviews / Trainwreck Blu-ray Review! Does The Amy Schumer Comedy Deliver The Laughs? Trainwreck Blu-ray Review! Does The Amy Schumer Comedy Deliver The Laughs? There are two kinds of “raunchy films” those that aim to be more than the sum of their parts and the films that go for the lowest common denominator. The trick for a really successful raunchy comedy is to make sure the lead is relatable and flawed with a hint of sympathy. That’s the trick facing Trainwreck, the new comedy from Judd Apatow. 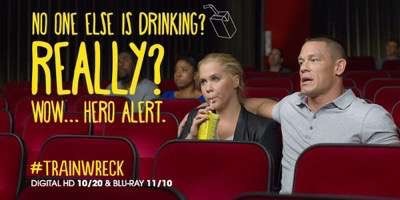 Trainwreck is out today on Blu-ray and stars comedy it-girl Amy Schumer as Amy, a girl who lives by the motto that monogamy isn’t realistic. This of course is used as a wall she puts up so that she never gets close to anyone or lets anyone get close to her. Amy’s father (Colin Quinn) is shown in flashbacks to be a philanderer who had the same motto in life, and this is presumably where Amy has gotten her focus in life from. Now working as a writer for a Details-esque magazine, Amy goes through men like Kleenex even while going through the motions of having a boyfriend with a muscle head named Steven (John Cena). This isn’t working for Amy, and she continuously looks for greener pastures, even if she’s not looking for the right kind of guy. She’s more of less looking for Mr. Right Now. Amy’s boss (Tilda Swinton) gives Amy an assignment, to interview a sports surgeon, Aaron Conners (Bill Hader). Amy doesn’t care about the assignment given that she loathes sports, but she finds that Aaron is one of kind. He’s affable, charming and a bit of a dork. He doesn’t play games and he falls for Amy hard. After they spend the night together Aaron has the audacity to actually call her the next day! Say wha? The crazy thing is, that Amy is at one intrigued by Aaron and drawn to him at the same time. As cloying as some of the film sounds, it actually works. Amy Schumer holds the film together and plays Amy as less of a Trainwreck and more of a product of her upbringing. She can be a bit much at times, but the humor of the film wins out. 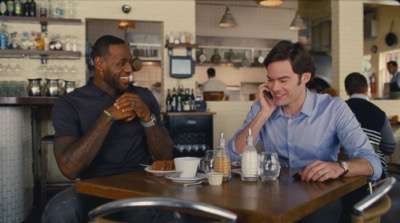 Bill Hader is perfectly cast as Aaron and lends his self effacing touch to the film. He’s a great counter balance to Schumer and they make a shockingly deft comedy team. The real highlights for me however were Tilda Swinton who after being given a complete physical makeover brings such an unique spin to the role of Amy’s boss. At once a ball buster and quirky career woman rolled into one, Swinton makes the role her own and proves that she is one of the best actresses working today. Also, John Cena… Comedian? Who knew? The formidable wrestler looks like he can smash a man’s head with his pinky finger and yet here he not only demonstrates his comedy chops but steals the show. He’s sympathetic, funny and clearly a mans-man. He has some of the best scenes in the film. Trainwreck arrives on Blu-ray in a fine transfer. In comedies the picture isn’t the foremost thing on a viewer’s mind like it is with an action film, however the fine details are excellent. The black hues are well done and the film has carries with it a gold-esque tint that was clearly a filmmaking choice. It lends itself well for the overall tone and feel of the movie. Trainwreck arrives with a load of bonus features, there are two cuts of the movie the unrated and theatrical version as well as deleted scenes and extended/alternate scenes. Secrets of the Wu – where characters discuss the Wu-Tang Clan. The Dogwalker – which gives viewers the full fake film clips as seen in the film. Directing Athletes: A Blood Sport – where the real life athletes in the movie talk about working with director Judd Apatow. Behind-The-Scenes – this is a section that encompasses a bunch of short behind the scenes clips. 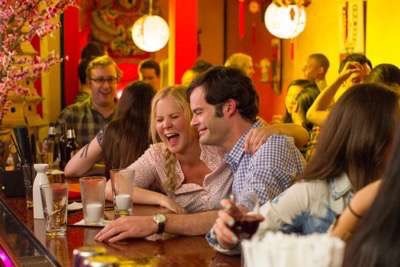 Trainwreck Comedy Tour – This featurette follows the cast traveling across the country to sell the film. There is also the original trailer and audio commentary tracks with Judd Apatow and Amy Schumer as well. Overall, I really enjoyed Trainwreck and thought that Amy Schumer was really something in the lead role. The supporting cast is more than top notch and it’s honestly a really funny film. If you’re a fan of raunchy-esque comedy I think you’ll really like this movie. It’s well done and at time downright hysterical! Trainwreck is out now on Blu-ray! Quantico: The Complete First Season DVD Review! 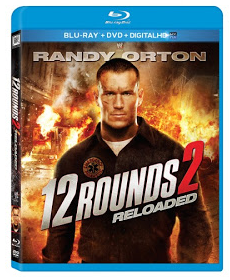 12 Rounds 2: Reloaded Blu-Ray Movie Review! TRAVOMANIA Says Randy ‘The Viper’ Orton Is Awesome In The Action Sequel! WWE Awesomeness! McFarland, USA Blu-Ray Review! Does This True Life Story Live Up To Expectations? Stevie Nicks Concert Review Wiltern Theatre Los Angeles, CA May 26, 2011 With Live Concert Photo Gallery!